Visitors to the British Museum have sometimes wondered how the massive ancient Assyrian winged bulls now on display there were actually transported from Iraq in the 1840s. 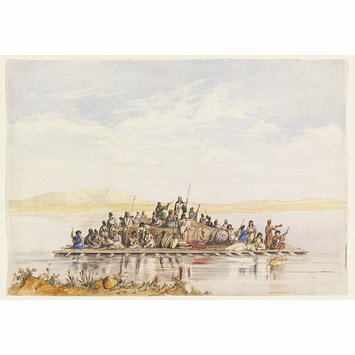 This watercolour shows one stage of their journey, on a raft down the Tigris. Austen Henry Layard had been funded by the Trustees of the British Museum to excavate the ruins of Nineveh and Babylon; and part of the plan was to bring back examples of the antiquities he had found. Layard describes the removal of the winged bulls from the site of the mound of Nimrud in Nineveh and Its Remains, 1849, from where they had lain for approximately the last 2,730 years. They were carefully loaded on to rafts, made in the traditional way of using hundreds of inflated goat and sheep-skins supporting a wooden superstructure. The top of the head of the sculpture can be seen on the right of the picture, emerging from its tarpaulin cover. Layard (who had learnt Arabic and Persian) recruited the crew locally, as he had done with his workforce. In April 1847, he sent them floating with the current, off on a six hundred mile journey down the river Tigris to Basra, where ships of the British Navy were waiting to take them the next 12,000 miles to England. Although the artist Cooper was not present on this occasion, he subsequently witnessed similar events, and would have been able to reconstruct the scene, perhaps using a sketch by Layard who was also a talented artist. Cooper was a painter in oils and watercolours from Nottingham whose previous works had been mainly of genre and literary subjects. 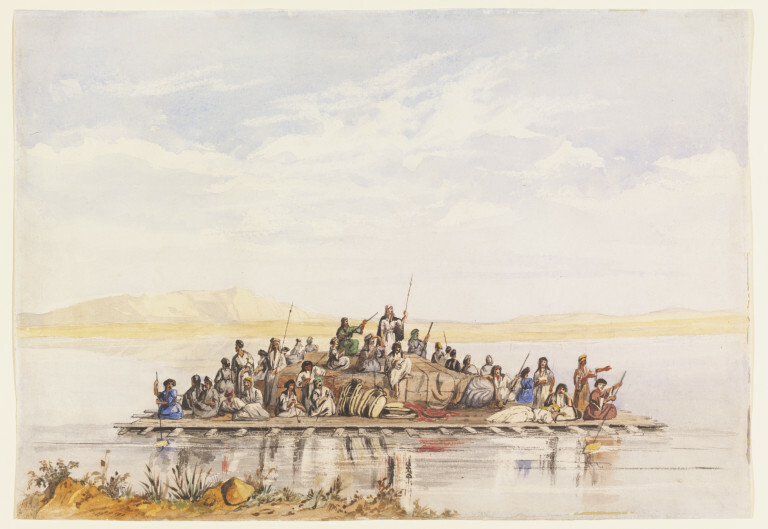 In 1849 he was selected by the Trustees of the British Museum to accompany Layard to Nineveh, and returned to England after visiting Kurdistan with him in July 1850. He exhibited at the Royal Academy and elsewhere in London, 1844?68 (including views of Nineveh). Cooper painted a diorama of Nineveh, presented at the Gothic Hall, Lower Grosvenor Street in London, with an accompanying lecture, in 1851. Formerly attributed to Layard: see Searight Archive. Layard describes the removal of the winged bull from Nimrud in Nineveh and Its Remains, 1849, Ch.XIII. It was loaded on to a raft and, on 22 April 1847, sent off down the Tigris to Basrah. Although Cooper was not present on this occasion, he subsequently witnessed similar events, and would have been able to reconstruct the scene, perhaps using a sketch by Layard. SD252-269 relate to Layard's second expedition to excavate the ruins of ancient Nineveh in 1849-51: see his Discoveries in the ruins of Nineveh And Babylon; with travels in Armenia, Kurdistan and the Desert: being the result of a second expedition undertaken for the Trustees of the British Museum, 1853.
Cooper's diary for January-August 1850 was in the possession of a descendant, Mrs Irene Lyon Coldstream: see photocopy in the Searight Archive. Other drawings from this expedition are in the BM, Department of Western Asiatic Antiquities. An oil, Scene from the Excavations at Nineveh, 1852, was formerly with the Mathaf Gallery, London. Explorations and Discovery in the XIXth Century, 1963 (exh.cat. ); J. Reade, Assyrian Sculpture, BM, 1980; Information from Frederick N. Bohrer, Irene Lyon Coldstream and Dr. Julian Reade: see Searight Archive.